The first was apparently a big enough hit (in home video sales at least) for the hit animated series that a follow-up is coming this fall. 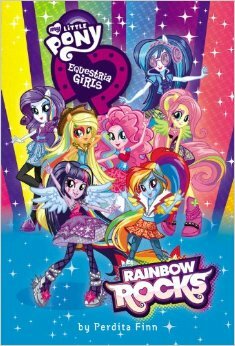 My Little Pony‘s Equestria Girls are returning in a sequel called “Rainbow Rocks.” The trailer went out online a couple days ago, and Hasbro released it on their MLP:FIM Facebook page earlier today. The company is keeping the plot secret for now — although you can apparently pre-order the novelization, which comes out in April — but the trailer would seem to indicate that Twilight Sparkle somehow makes it back to the “human” dimension to help Rainbow Dash and the rest of the “pony-gals” win a rock band contest or something…and perhaps taking on the humanized version of The Great and Powerful Trixie, the magical pony that has caused trouble for the friends in the past. Or so the leak of images of the toys would seem to indicate. Because, of course, Hasbro’s primary concerning is the selling of toys, and these movies and the television series are just the means by which to market such goods — which you can buy directly from Hasbro and other retailers even now, far in advance of the movie’s release. Indeed, the leak of the toys came before the official announcement with the trailer, so fans have been getting the idea of what to expect for about a month now. It is not yet clear if the company will go for a theatrical release, such as the limited releases of the first movie, or if they will go direct to DVD or VOD with this one. But given how early they are rolling out the ancillary merchandise, my guess would be for a larger limited theatrical release than the first movie, which they were probably conservative with given the uncertainties of how the audience and fan base would respond. As of tonight (my time), there are over 600 comments to the video post on the Facebook page, and they again show the type of fractured fandom that was seen with the marketing and release of the first one. But given that the first was successful enough to warrant a second one, it doesn’t seem that the infighting within the fan base hurt the movie. However, with a longer rollout, could negative online discussion hurt the sequel? A scholar’s job is never done — going to follow this story as it unfolds, and I would love to hear from all MLP:FIM fans on your thoughts as the Equestria Girls goes from one-off to spin-off. Yes! Finally someone writes about twilight sparkle toy.